Containing memoirs from members, former members and friends of the society. Published in an edition limited to sixty canonical copies! 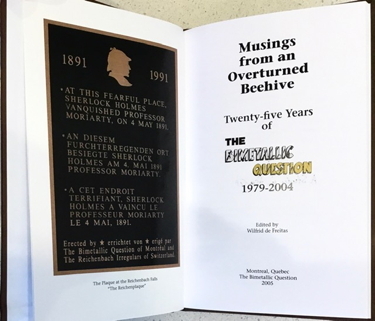 Musings celebrates twenty-five years of Montreal's only Sherlock Holmes society through essays, poems and reminiscences written specifically for this volume. It includes items by Bimetallic co-founders Wilfrid de Freitas and David Dowse, society friends Dr. Joe Schwarcz and Prof. Graeme Decarie, as well as a variety of other authors. The book is illustrated with colour photographs from the Society's history, and other images. The edition was limited to 60 copies. Each volume was hand numbered and assigned a canonical title, in the stories' original publication order (i.e. copy #1 is The Study in Scarlet, copy #2 is The Sign of Four). Purchasers were able to request specific titles. The edition is sold out thanks to our members and our fellow Sherlockians!